What it’s about: In the early 1600s, the precursor to modern-day Poland was officially the Polish-Lithuanian Commonwealth, with a monarch who was both king of the former and grand duke of the latter. And while Russia has had designs on Polish soil for much of their shared history, the reverse was true in the 17th century. Russia had a tumultuous period between the death of the last Rurik tsar in 1598, and the ascension of the first Romanov in 1613, known as the Time Of Troubles. During a decade and a half of civil unrest in Russia, Poland saw an opening. Strangest fact: Russia went from its most to least brutally effective leader in one fell swoop. When Ivan The Terrible died, he left behind his son, Feodor Ivanovich, who ruled for 14 years. Wikipedia describes him as pious, retiring, possibly mentally disabled, and completely uninterested in governing. His brother-in-law, Boris Godunov, ran the country in his name, and continued to do so after he died without leaving an heir. Godunov’s reign was marked by famines, and armed brigands terrorizing the countryside, and the nobility began to consider him a usurper. Into this power vacuum stepped a man claiming to be Feodor’s brother, Dmitriy—who had been stabbed to death years earlier. But Russia was so eager for a change in leadership, they embraced False Dmitriy, and he ruled as tsar for a year. Biggest controversy: Wikipedia doesn’t state this outright, but it’s possible False Dmitriy was a Polish agent. Poland was certainly happy about his ascension to the throne, as he was open to expanding Catholicism into his primarily Eastern Orthodox country. Poland went so far as sending troops to support False Dmitriy, until a noble named Vasily Shuyskiy murdered False Dmitriy, massacring his supporters, including 2,000 Poles, and seized power. The nobility didn’t support him, and a second False Dmitriy showed up, claiming legitimacy. Shuyskiy stayed in power long enough to make an alliance with Sweden, Poland’s enemy, and between that and the massacre, Poland quickly declared war, beating a combined Russian-Swedish army at the Battle Of Klushino, after which Shuyskiy was pushed off the throne and forced into monkhood. But instead of supporting False Dmitriy II, the Poles put forward their own candidate for the throne, Władysław, son of Polish king Sigismund III. After a promise that Władysław would maintain the Orthodox faith in Russia, he was welcomed into the capital, and Polish troops occupied the Kremlin. But, of course, it wasn’t that simple. Unhappy with the religious compromise, Sigismund decided to shove his own son out of the way and take power himself, so he could convert Russia to Catholicism. The Russian people who had welcomed Władysław turned against his father, and the Swedes declared war on Sigismund’s Russia for good measure, pushing yet another False Dmitriy. Things only got worse from there. Thing we were happiest to learn: Through the rose-colored glasses of perspective, both countries are able to look fondly back on the era. To Poles, their attempts to control Russia is considered a Polish golden age, as capturing Moscow was something even the Axis Powers were unable to do. 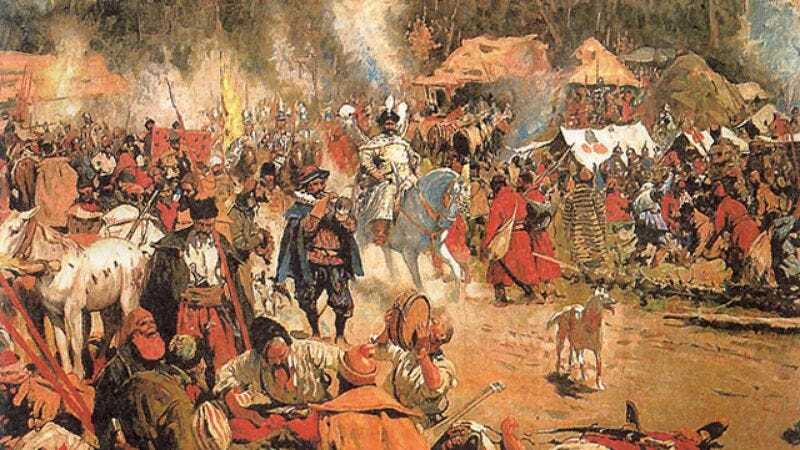 For Russians, fighting back the Polish usurpers to the throne helped preserve Russian Orthodox culture, and National Unity Day, begun in 2005, commemorates Moscovites pushing occupying Poles out of the city in 1612. The Time Of Troubles also inspired Pushkin’s play Boris Godunov, and Dvorak’s opera Dimitrij. Thing we were unhappiest to learn: While it’s easy for both sides to celebrate the war at a 400-year remove, things got a lot worse after they got better. With Sigismund and False Dmitriy III vying for the throne, there was a power vacuum. Meanwhile, Sweden invaded from the north, taking Novgorod and briefly putting their own Duke Charles Philip on the throne; the Poles still held Moscow and Smolensk (after a 20-month-long siege of the heavily fortified city); and with the southern border undefended, the Mongols led a series of devastating raids. Between the battles, widespread rioting, and even more widespread looting, tens of thousands of Russians died. Occupying Poles put down riots in Moscow by killing 7,000 people and setting fire to the city. In the meantime, Polish nobles who objected to the war tried and failed to overthrow Sigismund, and hoped for a diplomatic solution that would bring Russia peacefully into the Polish-Lithuanian union. But Sigismund steadfastly refused to make concessions to the Orthodox Church, and still believed he could take Russia by force. He marshaled support at home for a push to take Russia once and for all. But Poland no longer had any allies among the Russian people, and their invasion was beaten back. Smolensk revolted against their Polish occupiers, and cut off Sigismund’s army’s escape. He signed a treaty that gave Poland more territory, and left it the largest and most populous country in Europe, but fell far short of his goal of Russian conquest. The Russian National Assembly elected 17-year-old nobleman Michael Romanov as tsar. His grandfather had been an advisor to Ivan The Terrible, but his family had been exiled by Godunov. Despite his youth, and the chaos he inherited, he managed to stabilize Russia, and his family ruled until the Bolshevik Revolution. Best link to elsewhere on Wikipedia: One of the most fascinating figures in the Time Of Troubles was Maria Mniszech. Born in Poland, her father pushed her into marriage with False Dmitriy I, hoping that through her, he could control Poland’s choice for tsar. Two weeks after the wedding, however, Dmitriy was deposed, murdered, and had his ashes shot out of a cannon in the direction of Poland. His widow was spared, and she returned to Poland and married False Dmitriy II, claiming to recognize her husband, although the two men reportedly looked nothing alike. Her second marriage was only slightly longer than the first, before Dmitriy II was killed as well. A month after his death, Mniszech gave birth to their son, Ivan. Mniszech intended to put her son on the throne, but once Romanov was chosen as tsar, mother and son were forced to flee. They were quickly captured by the Cossacks, and 4-year-old Ivan was executed. Mniszech died in prison shortly afterwards. Further down the Wormhole: The Russian Tsardom changed many hands during the Time Of Troubles, and in Russian history. The title began with Ivan IV, who changed his title to tsar (derived from “Caesar”) from “Grand Prince Of Moscow.” When the Mongol Empire conquered the region in the 1300s, they built up Moscow to be the most important city in the Western side of their empire, and it’s been Russia’s capital ever since. Today Moscow’s skyline includes the tallest building in Europe, Federation Tower. Wikipedia has many lists of tallest buildings and structures, but also a history of the world’s tallest buildings, which we’ll examine next week.